This upcoming solar eclipse is almost exclusive to the continental US, and all of the US will see it, in some fraction. It is, I think, going to change American's lives, in some pretty profound ways. 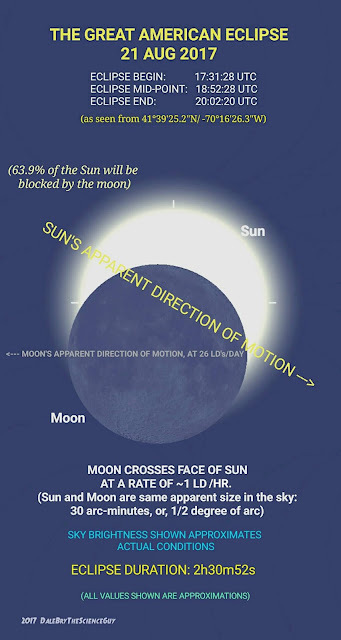 Most of us have seen lunar eclipses, or, eclipses of the moon. But most of us (myself excluded), have never seen a total eclipse of the sun. Graphic Created by Dale Alan Bryant. * Even though the solar eclipse I saw from Woods Hole was total, and this upcoming eclipse is partial, for most of the U.S., it will get dark enough in the eastern half of the country at mid-eclipse, that, if we're driving, we'll have to put the headlights on! If you're inside, you might want to turn on some lamps - for a few minutes anyway. * When the moon begins to clear the face of the sun, the birds will begin singing - thinking that it's dawn again! * For, possibly, the very first time - you will see whole crowds of people become silent. Everyone will start whispering. This is not only a visual event but a mental and spiritual one, as well. It's the kind of event that turns kids into amateur astronomers - and into professional ones, when they grow up! The eclipse will bring people together in ways we rarely get to witness. Nice post, Dale. The sky forecast is looking pretty good so far for the Cape Cod area on Eclipse Day.